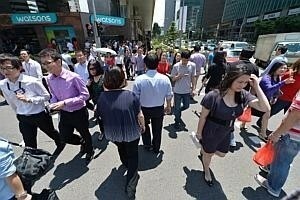 REGULATION of financial services in Singapore is a strong driver behind the growth of professional jobs here. According to recruiter Morgan McKinley's Asia-Pacific Employment Monitor released on Friday, Singapore saw a 7.4 per cent increase in professional jobs in the 12 months to January 2014. At least 15 per cent of the job increases came from regulatory hiring, said Morgan McKinley's chief operations officer for Asia-Pacific, Richie Holliday. He said that this stems from a "global desire to have a more stable financial services sector" post-credit crisis. But new regulations have led to an increase in risk, compliance and audit roles, both in banks and large corporations, he noted. As a result, there has been aggressive hiring in the regulatory space in the past two years, he added. According to Mr Holliday, as financial transactions carried out by banks and wealth management institutions here tend to be of higher volume and value relative to other countries in the region, more people are needed to ensure compliance. Also, with Singapore's position as a leading hub in areas such as shipping, large corporations are also subject to regulation. "Each of these sectors have their own rules and regulations in how they conduct themselves in financial transactions," he said, adding that Singapore requires strong regulation. But such a situation is not unique to Singapore. According to him, hiring activity in the regulatory space in larger financial services hubs such as Hong Kong and Tokyo is still on the rise. Regionally, these three locations have led the rebound in the financial services market, bringing about a significant 40 per cent growth in professional jobs in January from the previous year, which translates to about 1,100 jobs. Recovering global economic powerhouses in the US and Europe have also made a positive impact on the region in terms of professional job increases. Besides impacting hiring activity, improvements in the economy have also led to greater confidence for job seekers. Mr Holliday said: "Candidates who have perhaps been out of work, or have held on to their current job due to economic uncertainty, are increasingly proactive about finding a new role." While he said that hiring managers are cautiously optimistic, political and economic factors such as the protests in Ukraine "could cast a shadow over an otherwise positive outlook".